Tuesday, July 16, 2013 (Ottawa, ON) – Ottawa Fury FC today announced a multi-year exclusive apparel and equipment partnership with Admiral Sports. Admiral® will be the official sportswear supplier of Ottawa’s new North American Soccer League franchise and its senior and youth level teams. 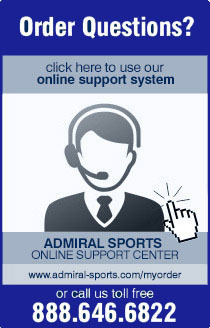 Admiral is the number one supplier to NASL teams highlighted by 2012 NASL Champions Tampa Bay Rowdies and 2011 NASL Champions Minnesota United FC. Admiral, the world’s oldest British football brand, supplied kits in the 1970s and 1980s for the English national team and Manchester United. The brand has a long history in Canada, having supplied kits for the Vancouver Whitecaps team that won the original NASL Soccer Bowl. Ottawa Fury FC will unveil their new Admiral kits to fans and media later this fall. The North American Soccer League is a professional soccer league established in the United States, Canada and Puerto Rico. The NASL member teams are: Atlanta Silverbacks, Carolina RailHawks, FC Edmonton, Fort Lauderdale Strikers, Minnesota United FC, New York Cosmos, Puerto Rico Islanders, San Antonio Scorpions FC and the 2012 champion Tampa Bay Rowdies. Indy Eleven, Ottawa Fury FC and the Virginia Cavalry will begin play in 2014. For more information about the NASL, visit www.NASL.com. Follow the NASL on Twitter @NASLOfficial and Facebook at http://www.Facebook.com/NASL.fans.